November 18, 2017Clearwater, FL – Entering the 2017 Fall Classic, Alexis Villalta wasn’t scheduled to be one of Venezuela’s starting outfielders. By the time the Oilers had convincingly won the championship, he was their MVP. 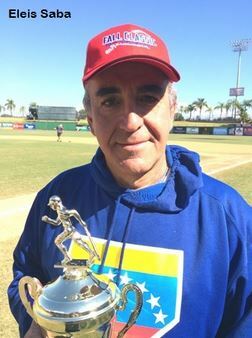 Villalta, who got his first playing time in the tournament’s second game, finished a stellar week with a pair of hits and runs scored, while Jorge Gonzalez went 4-for-4 with four runs scored and two RBI as Venezuela took advantage of uncharacteristically sloppy UAG defense to win its first title. Villalta and Gonzalez helped pace an offensive attack that accounted for 17 hits and scored in six of their eight innings at bat. Luis Duque, Richard Romero and Jhonatan Jaspe, Venezuela’s two, three and four hitters, combined for five hits, five runs scored and four RBI. With a line-up designed to score runs in bunches, the Oilers did exactly that in their first title game. The offensive mindset was never more important than during the critical fourth inning. Venezuela appeared in command, riding a strong start by lankly left-hander Jean Contreras and a trio of runs in its first two at-bats to a 3-0 lead. Then, without warning, the bottom of Tainos’ order sparked a surprising three-run uprising to tie the game. The Oilers used a crucial David Perez sacrifice fly to retake the lead a half-inning later, but it was a 30-minute bottom of the fourth that ultimately decided the championship. With one out and a man on first, Villalta, hitting 10th, reached on an infield single. Gonzalez followed with an RBI double down the first base line and a 5-3 lead, before a walk and wild pitch pushed the advantage to 7-3. When Jaspe’s two-out short fly ball to center was misplayed into a single, and a throwing error – one of five on the day for UAG – followed, another run scored and essentially put the game away. Not to be outdone, Andres Luchesi added a back-breaking single to left to plate the final run of the outburst and give Venezuela an insurmountable 9-3 lead. For Saba, Villalta and Gonzalez sparking the five-run outburst was as expected as it was effective. “When [Villalta] got in the line-up, he didn’t want to come out,” the manager said. “He always plays like it’s his last game. With the newly acquired six-run cushion, Contreras went about ensuring there would be no second Tainos comeback. Contreras was eventually replaced, but not after tossing seven innings of six-hit ball. Still, it was during this critical stretch that he was at his best. For Venezuela, the victory capped an unbeaten week as it finished 5-0 in round-robin play before defeating the Puerto Rico Mets (5-1) and Bluecats (13-4) in the playoffs. UAG was nearly as impressive, going 4-1 during the round-robin portion of the tournament. The Tainos then topped the Long Island Brewers 10-6, before reaching the title game with a thrilling 12-10 victory over the Central Ohio Reds.